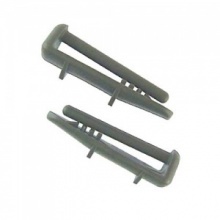 Genuine replacement basket bearing support clips for Bosch dishwasher. 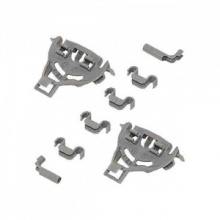 Genuine replacement basket bearing support clips for Neff dishwasher. Genuine replacement set of eight lower basket wheels to fit Aeg dishwasher. Genuine replacement set of eight lower basket wheels to fit Electrolux dishwasher. Genuine replacement set of eight lower basket wheels to fit John Lewis dishwasher. Genuine replacement set of eight lower basket wheels to fit Zanussi dishwasher. Quality replacement pack of 8 grey upper basket wheels to fit various Aeg dishwashers. Quality replacement pack of 8 grey upper basket wheels to fit various Electrolux dishwashers. 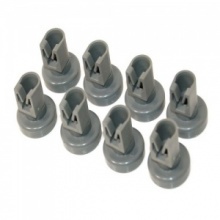 Quality replacement pack of 8 grey upper basket wheels to fit various Zanussi dishwashers. Compatible replacement set of eight lower basket wheels to fit Aeg dishwasher. Compatible replacement set of eight lower basket wheels to fit Electrolux dishwasher. Compatible replacement set of eight lower basket wheels to fit John Lewis dishwasher. 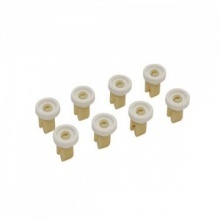 Compatible replacement set of eight lower basket wheels to fit Zanussi dishwasher. Low cost replacement pack of 8 upper basket wheels to fit Aeg dishwasher models listed. Low cost replacement pack of 8 upper basket wheels to fit Electrolux dishwasher models listed.